In 1971 British currency went through a decimalization process (100 pence in a pound) simplifying notation, pricing, and spending. This article will provide a breakdown of the old monetary system, concentrating on the Victorian era and the various coins that existed and were used in Britain, and touch on those minted for colonial holdings. There were changes during the 1800s that will be included. I will not cover every facet of what is a vast subject. A replica penny, halfpenny, and farthing, of the smaller bronze sizes, displayed together for reference. The coins listed below are all depicted at the same size, so please refer to the descriptions for actual diameters. Note that the diameters of the least valuable denominations were minted in smaller sizes when the coins changed from copper to bronze. What follows isn’t necessarily intended to be read from top to bottom, but as a reference guide for each coin. Queen Victoria depicted in her Imperial State Crown, mourning crown, and diamond and sapphire tiara. The crowns featured on the coins throughout the Victorian era were St. Edward’s Crown, the Queen’s Imperial State Crown, the little crown she had made to perch on top of her mourning veil, and a tiara. Victoria withdrew from public life following the death of her husband in 1861. In 1870 she agreed to start making appearances again, and had a crown made to replace her Imperial State Crown, which she found heavy and wouldn’t work well with a mourning veil. The new crown followed the basic design of British crowns with four half-arches, cross pattees, and fleur-de-lis, but no inner velvet cap, and contains 1,187 diamonds. (Coloured stones wouldn’t have been acceptable with mourning dress.) The tiara appeared lastly, and is thought to be the flexible diamond and sapphire headpiece crafted in 1842 as a gift from Prince Albert, which Victoria always referred to as a coronet. She felt the sapphires were dark enough to match mourning attire. Heraldry used on coins included the Royal Arms detail of the shield depicting England twice, Scotland and Ireland, St Edward’s crown, and the Order of the Garter Star, shown here is Queen Victoria’s gem encrusted decoration. Half farthing: Made of copper, and worth only an eighth of a penny, these little coins were 18 mm in diameter and minted many years between 1828 and 1856, originally intended for use in Ceylon. 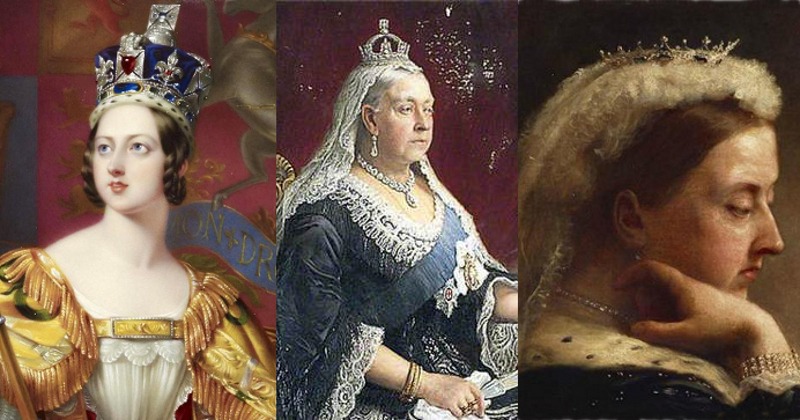 During Victoria’s reign they were produced ten years: 1839, ’42 to ’44, ’47, ’51 to ’54, and ’56. A bust of the young queen appeared on the obverse (front), and on the reverse read HALF FARTHING with a crown above and a rose below, then in 1842 and ensuing years the addition of a thistle and shamrock with the rose, because the coin became legal tender throughout the United Kingdom. Whether it is Victoria’s Imperial State Crown or St. Edward’s Crown (which looked very much alike) is debatable, but most lean towards the latter because what appears to be the same crown was featured on coins prior to Victoria’s reign. The coins were used in Britain and Ceylon until they were demonetized (no longer accepted) in 1869. There were also quarter farthings produced for Ceylon, and third farthings produced for Malta. Farthing: Dating back to the reign of Charles I when they were minted in various forms of tin or copper (or a combination) and sometimes used as tokens, during the 19th Century they were copper until 1860 when they switched to bronze. 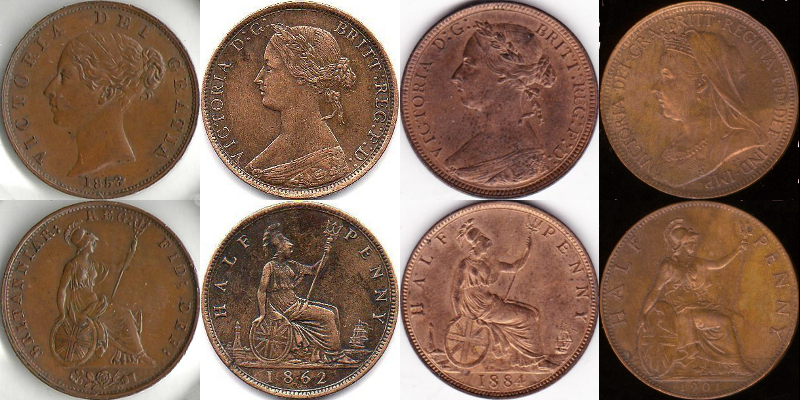 Worth a quarter of a penny, during Victoria’s reign the copper years were 22 mm in diameter and the bronze years 20 mm, and produced every year except 1837, ’70, ’71, and ’89. 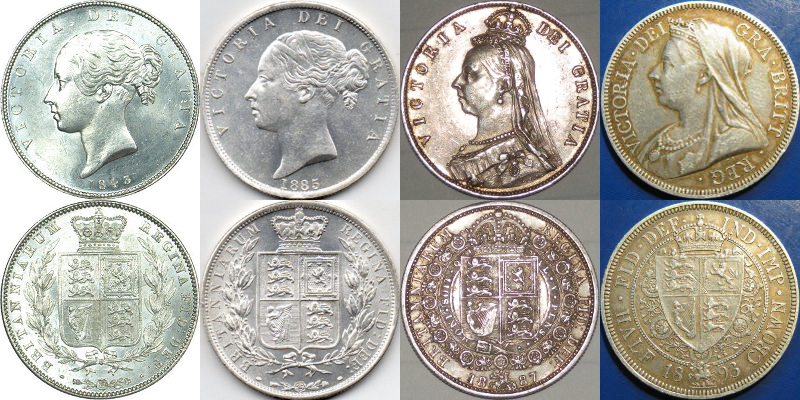 The coins featured a bust of the queen on the obverse with the date below, which changed along with the metal used in 1860 to include a laureate and draped robe on her shoulders, and to an older bust in 1874, then elderly and veiled in 1895. On the reverse sat Britannia with a helmet, shield and trident, and a rose, thistle and shamrock below, then in 1860 a lighthouse and sailboat were added, and the date appeared below. From 1838 to the end of 1859 the same dies used to produce the obverses of the gold sovereign were used on the farthings. Farthings were accepted in circulation up until 1960. 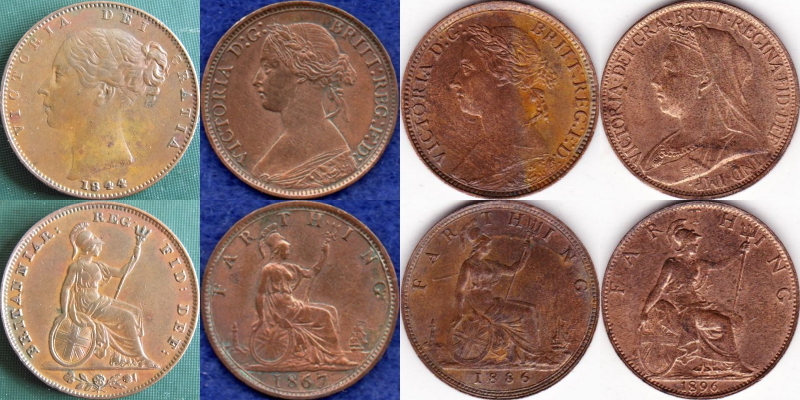 Halfpenny (ha’penny, hayp’ny): Like the farthing during Victoria’s reign, the halfpenny was minted in copper up until 1860, then in bronze. 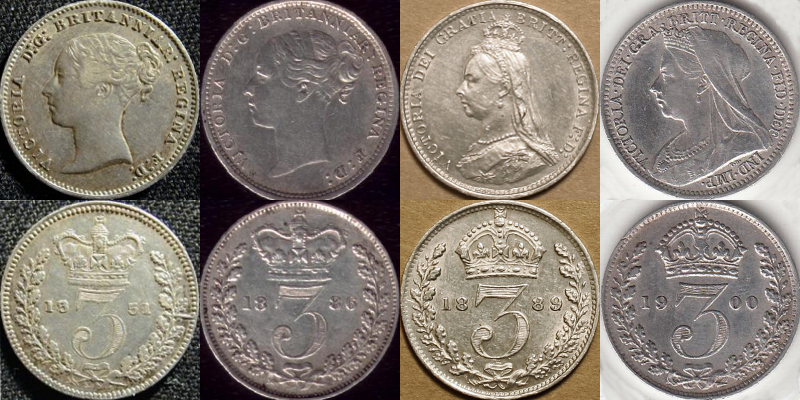 The diameter remained the same, at 25.5 mm (about an inch across) and featured a bust of the queen on the obverse similar to the farthing: the young bust with the date below(1838-60); a laureate and draped bust (1860-73); an older looking Victoria with laureate and draped bust (1874-94); and an elderly veiled bust (1895 to 1901). On the reverse sat Britannia with HALF PENNY around the edge, and rose, thistle and shamrock below, replaced by the date in 1860. The lighthouse and sailboat were added in 1860, but removed in 1895, and the design of Britannia was enlarged. Halfpennies were produced for circulation until 1967. Penny: First minted in the 8th century, by the time Edgar became King of England in 959 the penny was accepted throughout the country. The coins started off made of silver, but in the late 18th century switched to copper, then to bronze in 1860. Pennies were minted every year of Victoria’s reign, featured obverses with busts of the queen, and reverses with a seated Britannia holding trident and shield, and had a diameter of 34 mm while made of copper up until 1860, then 31 mm while crafted of bronze from then on. 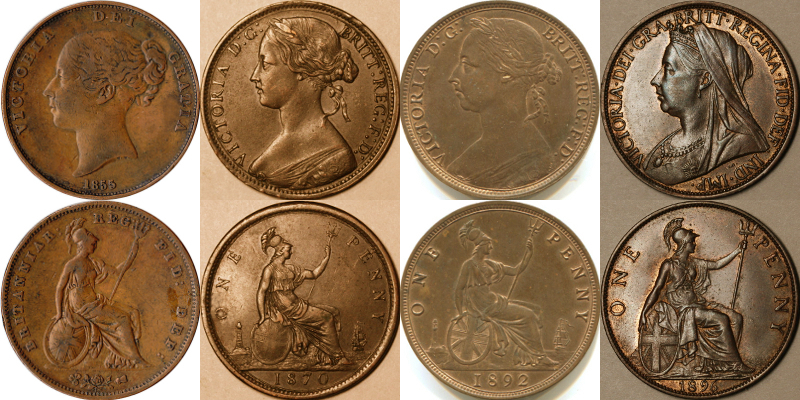 Like the farthing and halfpenny, four basic busts of Victoria were used: a young bust (1838-60); a draped bust (1860-73); an older draped bust (1874-94); and an elderly veiled bust (1895 to 1901). As noted above in regards to the halfpenny, the date moved, the rose, thistle and shamrock were removed, and a lighthouse and sailboat were added in 1860. Then in 1895 the lighthouse and sailboat were removed and Britannia enlarged. There were 12 pence in a shilling, 240 pence in a pound, which is the correct word to use when referring to pennies added together. When you are holding a handful of these coins, they are pennies, when they are put together or combined with other coins, the total or value becomes pence. Penny-halfpenny (three half-pence, one and one-half pence), were small silver coins struck for circulation in Jamaica and Ceylon. During Victoria’s reign they were produced from 1838 to 1843, and 1860 to 1862. Twopence (cartwheels, half groat), a big (41 mm diameter) copper coin with a thick rim (5 mm), minted only in 1797 with a laureate and draped profile of George III on the obverse and Britannia holding an olive branch and trident on the reverse. About 720,000 were produced and they remained in circulation until the introduction of bronze coins in 1860, but they were generally considered too heavy for regular use. Fourpenny bit (fourpence, joey, groat): These coins were crafted with the same small diameter as the threepennies (16 mm), but were thicker and therefore a little heavier. Groat was a traditional name for a silver coin dating back to the 13th century. 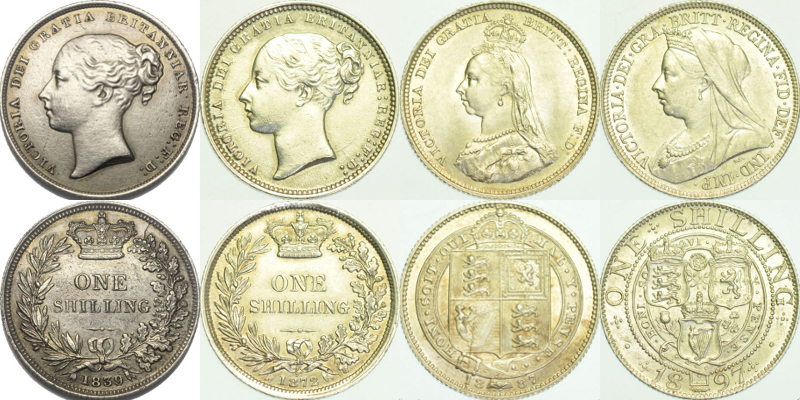 During Victoria’s reign they were minted for circulation within Britain from 1838 to 1855 with a value of four pence. The coins featured a young bust of the queen on the obverse, and Britannia with the date below on the reverse and FOUR PENCE around the edge. The nickname joey came from Joseph Hume (Member of Parliament for Weymouth, Dorset) who successfully campaigned for the reintroduction of the fourpenny in 1836. The story goes that the toffs didn’t want to carry copper coins, and cab fares within London averaged fourpence. If sixpence was offered, the cabby would keep the balance as a sort of gratuity unless the rider insisted on change. Then the cabby might give 16 half farthings in return. Sixpence (tanner, half shilling): Made of silver and 19.5 mm in diameter, from 1838 to 1887 the sixpence obverse featured a young profile of Victoria with her hair in a bun, but she did age slightly in 1880. The reverse had SIX PENCE within a wreath, a crown above, and the date below. In 1887 a Jubilee version was issued with a crowned and robed much older bust and a shield on the reverse. Some of these coins were snatched up by the criminal class who passed them off as half sovereigns after a gold plating, forcing the Royal Mint to withdraw them. The sixpence then returned to the previous reverse design, but with the Queen’s mourning crown. The Jubilee bust remained on the coins until 1893, when an elderly veiled bust was selected. The nickname “tanner” likely came from John Sigismund Tanner (1705 to 1775) who was the Chief Engraver of the Royal Mint at the Tower of London from 1741 until shortly before his death. 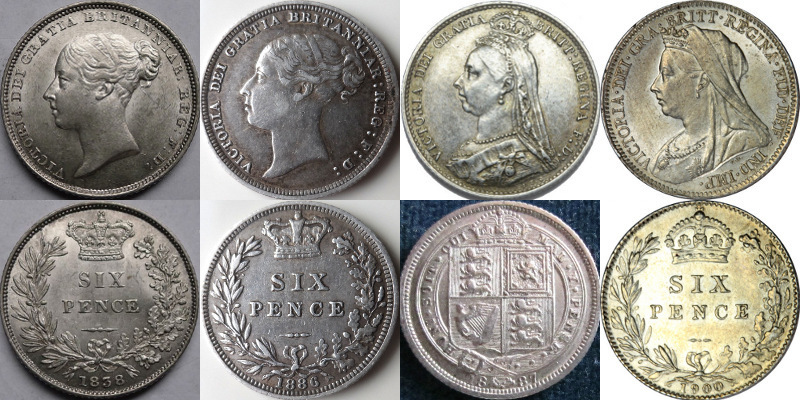 Shilling (bob): Made of silver with a value of 12 pence and a 24 mm diameter, shillings were minted every year of Victoria’s reign (except 1847 in preparation of decimalization, and yet there were 1848 and 1849 shillings produced) and three busts were used; a young bust from 1838 to 1887, a Jubilee bust from 1887 to 1892, and an elderly veiled bust from 1893 to 1901 (all of which had numerous slight variations). On the reverse from 1838 to 1887 was ONE SHILLING encircled by a wreath, a crown above and the date below. With the Jubilee in 1887 the reverse featured the Royal Arms shield with a crown and encircled by a garter, the date below, and with the change in 1893 came three shields (England, Scotland, Ireland) with a garter and ONE SHILLING around the edge, the date below. The earliest record of a shilling being called a bob comes from the Old Bailey (the Central Criminal Court beside Newgate Prison) in 1789, when it was a cant term used by the infamous London lawless faction. Florin (two shilling, two bob bit): While there did exist a medieval gold florin, during Victoria’s reign it was silver and worth 24 pence. Parliament were debating the idea of monetary decimalization and in 1849 introduced a coin valued at one tenth of a pound to test public opinion. This florin was 28 mm in diameter and had an unusual design: the obverse portrayed the Queen wearing a crown (the first time since Charles II a British monarch had appeared thus) with VICTORIA REGINA and the date around the edge. The crown is probably based on her Imperial State Crown, but altered to fit congruously with the edge of the coin. The reverse had cruciform shields with crowns representing England (x2), Scotland, and Ireland, and a rose, thistle, rose, and shamrock in the angles, and a rose in the centre, encircled by ONE FLORIN ONE TENTH OF A POUND. Coins normally included Dei Gratia (By the grace of God) as part of the inscription, but this didn’t, so many started referring to them as the Godless Florins. (Production of the half crown ceased in the hopes that this new coin would become popular and established, allowing a switch to ten pence to a florin, ten florins to a pound, but Brits stubbornly held out until 1971.) 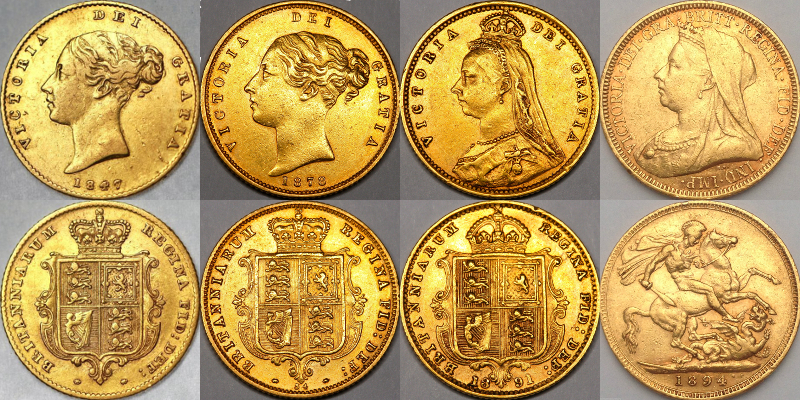 Although retaining the date 1849, the coins were struck in 1850 and 1851, then replaced by a new design in 1852, which lasted until 1887, with three profiles used over the years. The diameter increased to 30mm and Victoria aged a bit, but continued to wear a crown, and side plaited tied back hair. The script took on a decidedly Gothic look, included d.g., short for Dei Gratia, and the date in Roman numerals (which caused some confusion for the uneducated). The reverse still featured the cruciform shields and symbolic flora, but the centre changed to a floriated cross, and the wording was inscribed in Gothic-style letters. In 1887 a Jubilee bust florin was minted with a plain VICTORIA DEI GRATIA inscribed around her. The cruciform shields on the reverse were separated by sceptres at the angles, and the Garter Star in the centre, with no indication of the value. The size decreased slightly to 29.5 mm, and in 1893 the veiled bust was introduced with a further decrease in diameter to 28.5 mm. On the reverse were three three shields with a rose, thistle and shamrock, crossed sceptres, encircled by a garter, a crown above, and the date below, ONE FLORIN TWO SHILLINGS on the edge. Half crown: First issued in 1526 as a small gold coin, during Victoria’s reign it was silver, had a 32 mm diameter, and equalled 2 shillings and 6 pence, or 30 pence (one eighth of a pound). From 1838 to 1850 the obverse featured a young bust of the Queen with her hair in a bun and the date underneath. The reverse portrayed a shield bearing the Royal Arms, encircled with a laurel wreath, a crown above, and a rose, thistle and shamrock below. 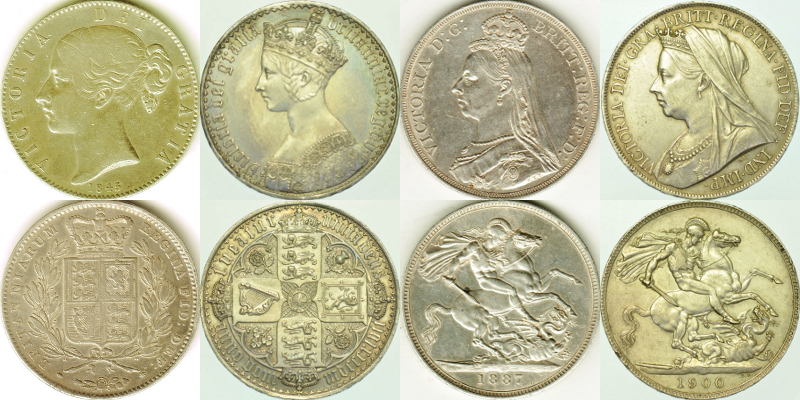 There weren’t any half crowns minted for circulation from 1851 to 1873 because the florins were brought into use. When the half crown was reintroduced in 1874 it still had the old design, and didn’t change until Victoria’s Golden Jubilee, when the bust included a crown, jewellery and robe. The reverse retained the shield, with a garter and decorative ring replacing the laurel wreath, the crown changed to match the obverse, and a small mounted St. George slaying a dragon went below with the date. In 1893 an elderly veiled bust appeared, and the reverse simplified but retained most of the same design features. Double florin: This coin appeared in 1887 with the new Jubilee coinage series, and was supposed to encourage the decimalization of the currency. A large silver coin (36 mm in diameter), it was worth one fifth of a pound, or 48 pence. The double florin was unpopular, people preferring the half crown, and issued for circulation only four years, ending in 1890. The obverse featured the usual Jubilee profile of the Queen wearing her little crown, mourning veil, jewellery and robe, and the reverse had four crowned cruciform shields representing England (x2), Scotland and Ireland, with sceptres in the angles and the Garter Star in the centre, the date above (similar to the Jubilee florin). 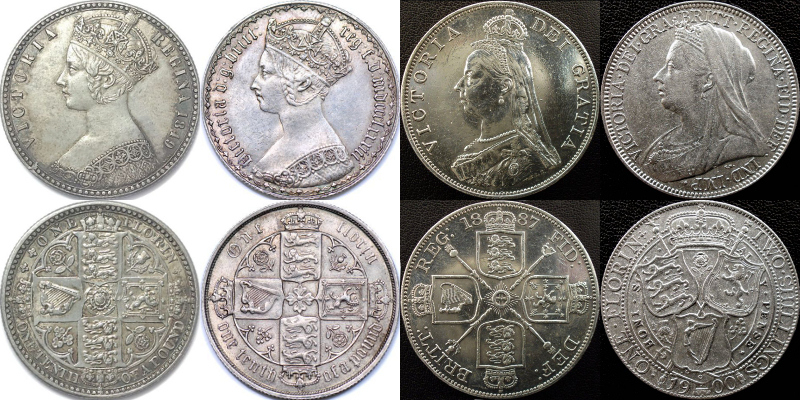 Crown: A coin dating back to 1526 (originally named the Crown of the Double Rose), during Victoria’s reign it was a large (38 mm), silver, and equalled 60 pence, or 5 shillings, or a quarter of a pound, and only minted for circulation a few years in the 1800s. The early issues (1844, 1845 and 1847) had a young profile of the Queen with the date below, and on the reverse a large shield bearing the Royal Arms, crowned and encircled by a laurel wreath, a rose, thistle, and shamrock below. Late in 1847 a small issue of 8,000 coins were struck in the Gothic-style and not meant for circulation (the style first appearing to the public on 1849 florin), with the Queen wearing her Imperial State Crown and robes, on the reverse was cruciform shields with crowns representing England (x2), Scotland, and Ireland, and a rose, thistle, rose, and shamrock in the angles, the Garter Star centred and trimmed down by the bases (bottom points) of the shields. From 1887 to 1892 a Jubilee coin was struck with the Queen wearing her little mourning crown and veil, jewellery and robe. The reverse portrayed a mounted St. George slaying a dragon with the date below. In 1893 an elderly veiled bust appeared on the obverse, the reverse remained unchanged, and was issued every year until 1900. Half sovereign: Introduced in 1544 under Henry VIII, discontinued in 1604, then minted again starting in 1817 and throughout the 19th century, this gold coin was worth 120 pence, or 10 shillings, and during Victoria’s reign measured 19 mm in diameter. The obverse had a young bust (with slight variations) with the date below up until 1887 when the Jubilee bust was used and the date moved to the reverse. The elderly veiled bust started in 1893. The reverse sides featured the Royal Arms with the crown changing in 1887 to match the obverse, and in 1893 St. George slaying a dragon, with the date below. Sovereign (pound): Equalling 240 pence, or 80 threepence, or 40 sixpence, or 20 shillings, or 10 florins, or 8 half-crowns, or 4 crowns, the gold sovereign was minted throughout Victoria’s reign with a diameter of 22 mm. The obverse featured a young bust (which aged slightly) with the date below from 1838 to 1887 when the Jubilee bust appeared. From 1893 to 1901 an elderly bust was used. The reverse started off featuring the Royal Arms with a crown and laurel wreath, a rose, thistle and shamrock below, then in 1887 changed to St. George slaying a dragon. 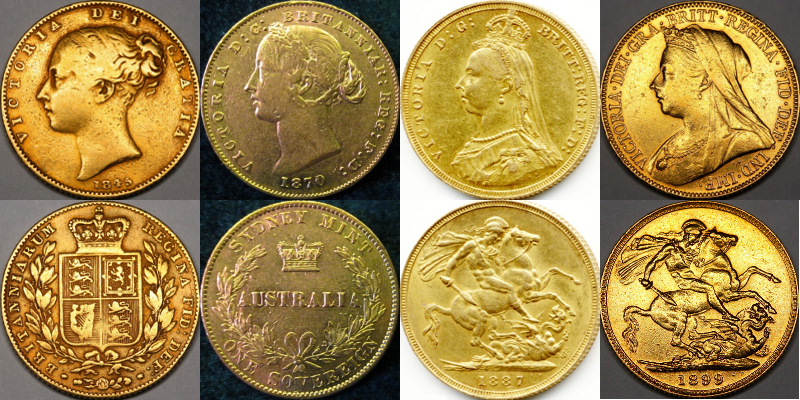 Gold was shipped from Australia to London annually for the production of coins, and by 1855 a mint in Sydney opened, then one in Melbourne (1872), and in Perth (1899). The Sydney mint used different dies than the Royal Mint for fifteen years, so the sovereigns from 1855 to 1870 have greater variations. Guinea, worth 21 shillings, a gold coin not commonly circulated after 1813, but the term remained in use and was applied to luxury items and the fees paid to professionals and artists. The name came from the Guinea coast which was famous for its gold. A painted half penny pendant, a penny with Victoria altered into a fireman, and a heavily enamelled half crown brooch. Thanks! Your blog is very helpful! Thanks, this is a great guide. It’s nice to have all the coins together with pix. I found out exactly what I needed. 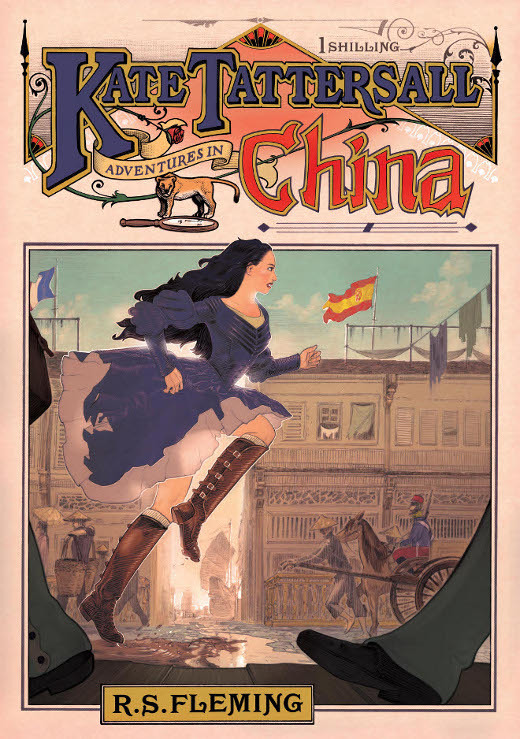 This site is like a one-stop shop for mid 1800s info. Thanks! I think the site has an error relating to Victorian shillings. As far as I know there was no mintage of the 1/- coin in 1847. @Jim, you are absolutely correct, and thank you for pointing this out. I have amended the information. I find it very odd that parliament decried no shillings for 1847 in preparation for decimalization, and yet minted them in 1848 and then in 1849, when the florin was supposed to replace the shilling. You helped me a lot thank you. Were the quarter farthings minted for use in Ceylon legal tender in Britain as well? Thank you! Hi David, my research doesn’t show quarter farthings ever accepted as legal tender in Britain, but some of the little coins may have come from Ceylon and used by the wretchedly poor. They may have passed the coins amongst themselves for small purchases. Thank you for the blog. I came here specifically to find out which crown is depicted on the 1870 Australian Sovereign and to my delight you mentioned it. To me it looks too square to be a St. Edwards but too rounded to be the State crown. Thanks in advance to anybody that can shed some light, and thanks again for the blog. This site is wonderful – I wish there was a trustworthy person to sort mine out – but I feel as my 1870 Queen Victoria is loose that there is no value. This excellent site with such good research helped. Thank you so much.